The Osprey (Pandion haliaetus) - also commonly referred to as "Seahawk", Fish Hawk or Fish Eagle -- is a long-winged, medium-sized, fish-eating raptor with a worldwide distribution. It is found in temperate and tropical regions of all continents except Antarctica; although in South America it only occurs as a non-breeding migrant. In North America, there are amongst the larger bird of prey. They generally breed in temperate climates and winter in the tropics; and occur in areas with shallow water, both fresh and salt, with abundant fish. 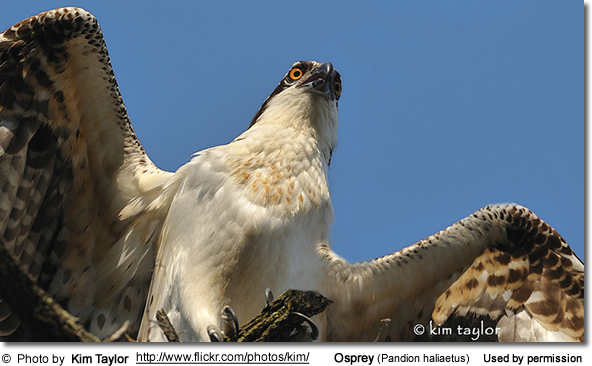 Even though it nests near water, the Osprey is not a sea-eagle. Their typical lifespan is 7–10 years, though some have lived 20–25 years. 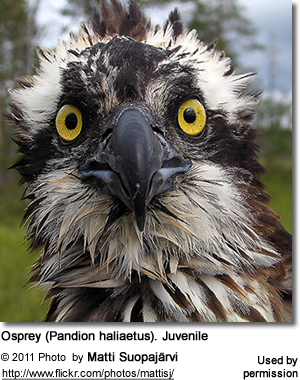 The oldest European osprey on record lived to be over 30 years of age. Afrikaans: Visvalk ...Czech: orlovec øíèní, Orlovec rícní, Orlovec ?í?ní, Orlovec ?í?ný ...Danish: Fiskeørn ... German: Fischadler ... Spanish: Águila calzada, Águila de Mar, Aguila Pescadora, Águila Pescadora, Áquila pescadora, Gavilán Pescador, Guincho ... Finnish: kalasääski, Sääksi ...French: Aigle botté, Aigle pêcheur, Balbuzard, Balbuzard fluviatile, Balbuzard pêcheur ... Irish: Coirneach, Iascaire coirneach ...Indonesian: Elang ikan, Elang laut burik, Elang Tiram, Kwéa ... Italian: Falco pescatore ... Japanese: misago, Shokyu, Su-dori, Uo-taka ... Dutch: Visarend ...Portuguese: águia pesqueira, Aguia-pescadora, Águia-pescadora, Águia-pesqueira, caripira, gavião-caipira, gavião-caripira, gavião-do-mar, gavião-papa-peixe, gavião-pescador, guincho ... Russian: Skopa, ????? ... Swedish: Fiskgjuse ...Turkish: Bal?k kartal?, balyk kartaly ... Chinese: [e], [yu-ying], ??, ? ?, ?(??), ? 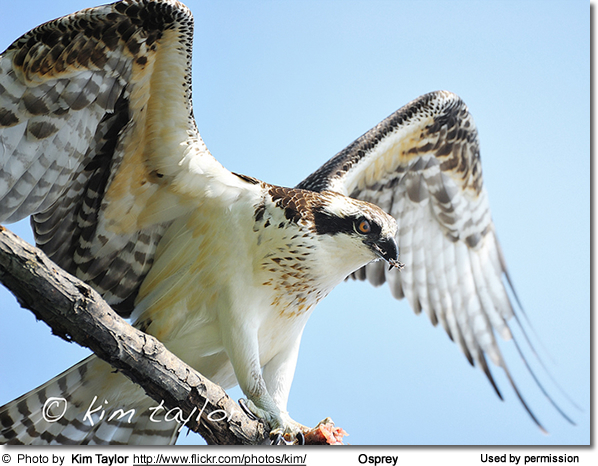 Ospreys in many ways resemble Bald Eagles, but Ospreys can easily be identified by their white under plumage. 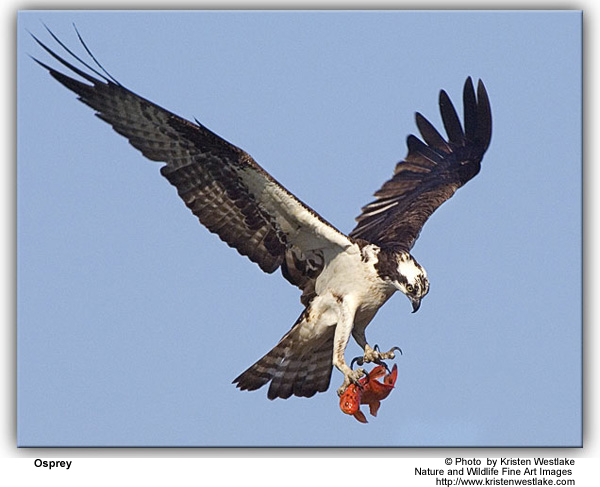 Eagles and ospreys are often found in similar habitats and eagles have been observed forcing ospreys to drop the fish that they have caught so that they can steal them in midair. Unlike Bald Eagles, Ospreys can become completely submerged during a dive into water and are still able to fly away with their prey. Their oily and dense plumage provides water proofing. They can dive up to 3 feet or 1 meter below the water surface. The Osprey is the only raptor (bird of prey) with a reversible outer toe, which allows it to hold on to its prey with two toes in front and two behind. 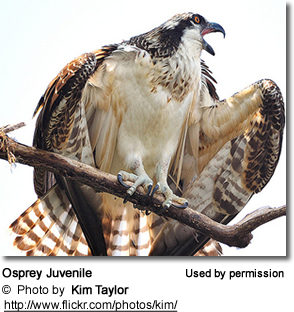 The underside of the osprey foot is covered with spines, called spicules, which allow it to hold onto slippery fish. Often, the osprey will aerodynamically position a fish headfirst in its talons (claws) before returning to the feeding perch or the nest. Ospreys generally pair for life, but will 'divorce" if a mating is unsuccessful. The female chooses her mate based on the quality and location of his nest. In North America, they breed from Alaska, through north-central Canada, and Newfoundland south to Arizona and New Mexico and along the Gulf, Atlantic and Pacific Coasts. They winter from the southern United States south to South America. 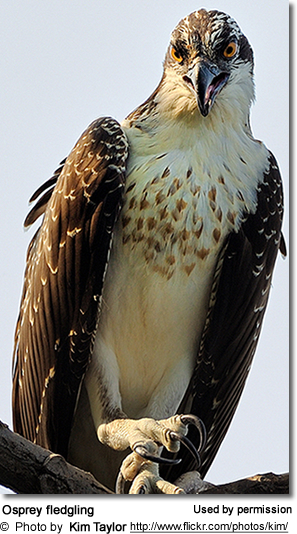 The ospreys are most numerous in Florida. In New Hampshire, they are listed as a threatened species due to declines in their numbers in recent years. Ospreys generally migrate in flocks of 8 to 10. Females tend to migrate earlier. Even though most of the traveling will be done during the daytime, they may fly at night - particularly when crossing over water. They fly on average 160 - 170 miles (260–280 km) a day with a maximum of 265 miles or 430 km a day. American and Canadian Ospreys breed from Alaska and Newfoundland south to the Gulf Coast and Florida. They winter further south from the southern United States through to Argentina in South America. However, some remain in the southern US states, such as Florida and California. 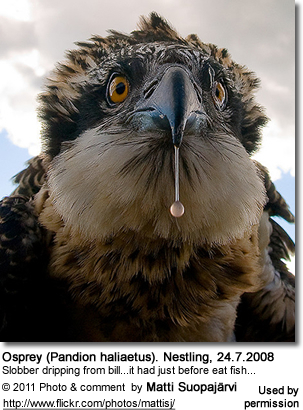 European Ospreys breed throughout Europe north into Scandinavia and Scotland, though not Iceland. They mostly winter in North Africa; but some also winter in South Asia. An Osprey ringed in Norway was recovered in western India. Australasian Ospreys tend to be resident (non-migratory). In Australia, they are found patchily around the coastline, though there are non-breeding visitors to eastern Victoria and Tasmania and the Bismarck Islands, Solomon Islands and New Caledonia. They are uncommon to fairly common winter visitors to all parts of South Asia, and Southeast Asia from Myanmar through to Indochina and southern China, Indonesia, Malaysia and the Philippines. 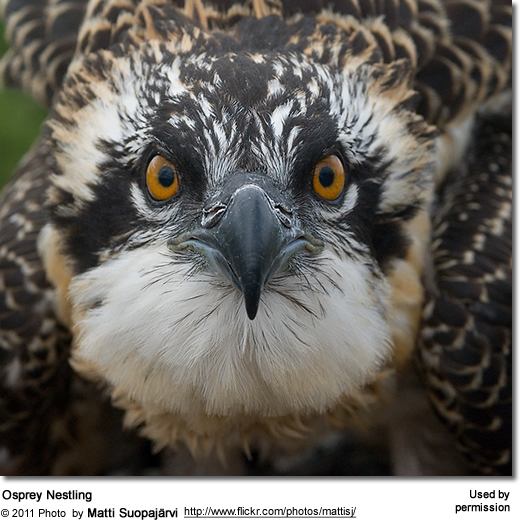 The Ospreys found in Singapore may migrate north to breed, but some are seen year-round. These are likely to be either immature birds or non-breeding adults. The Ospreys tolerate a wide range of habitats, nesting in any location near a body of shallow water with an adequate food supply, including temperate lakes, rivers, tropical coastal waters, boreal forest ponds and desert salt-flat lagoons. They prefer habitat with tall trees or snags for nesting. 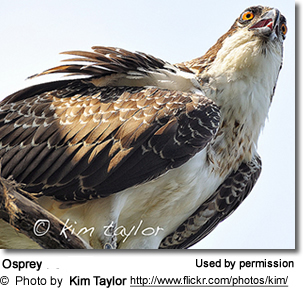 Ospreys are unusual insofar as a single species occurs nearly worldwide. There are four generally recognized subspecies although the subspecies are not unequivocally separable as differences are minor. Some authorities only acknowledge the first two. Range: Eurasia. Occurs in Scandinavia east to Japan and south to Mediterranean, Red Sea and Cape Verde Islands. They winter south to South Africa, India, west Indonesia and the Philippines. Range: North America - Labrador west to Alaska and south to Florida and Arizona. Winter south to Peru, Chile and southern Brazil. Large nesting populations are also found in coastal areas of northwestern Mexico (Sonora and Baja) - these osprey populations show plumage characteristics in between these nominate and carolinensis subspecies. ID: Larger. Darker plumage. Has a paler chest than nominate race and a more pronounced chest band. Darker eyeline. Range: Found in the Caribbean islands, including Bahamas, Cuba and Belize. Non-migratory. ID: Very pale head and chest compared to nominate race, with only a weak eye mask. Range: Found around the coastline of, and along some large rivers within Australia east to New Caledonia and south Tasmania; and north through New Guinea to Java and Sulawesi. Non-migratory. [Pandion haliaetus melvillensis]- not an officially recognized subspecies. Probably invalid. Ospreys generally measure from 50 - 66 cm (20 - 26 in)The female is slightly larger measuring between 60 - 66 cm (24 - 26 in) ; the male is about 50 - 55 cm (20 - 22 inches) long - including beak and tail. There are some clear markers as far as gender is concerned, although some plumage variations do exist. It is generally easy to identify the gender of the members of breeding pairs; however, it is more difficult with individuals. The head is white or greyish except for a dark brown stripe from the eye to the back of the head. It has a short hooked, black beak with a blue cere (skin above the upper bill). The nape (lower hind neck) is brown. The eyes are yellow-golden to brown. The translucent "third eyelid" is pale blue. The upper plumage (nape, back) is dark brown to black. The chest and belly are mostly white or greyish. They have a short brown tail with a number of medium-sized white bands. Their feet are equipped with spiny scales and long talons (claws) that give them a firm grip on slippery fish. Unlike other raptors, the Osprey has four equal toes. The outer one is reversible, enabling the bird to seize its prey with two toes pointing forwards and two pointing backwards. 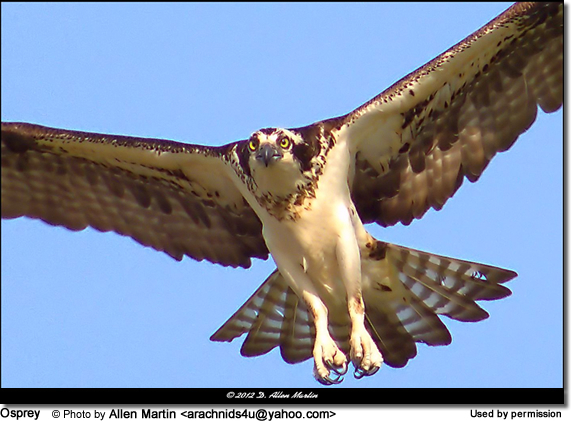 Ospreys have long, narrow, arched wings with four long "finger" feathers (and a shorter fifth). The wings taper to a rounded tip. The upper wing feathers are brown-black. The flight feathers below are white barred with black. 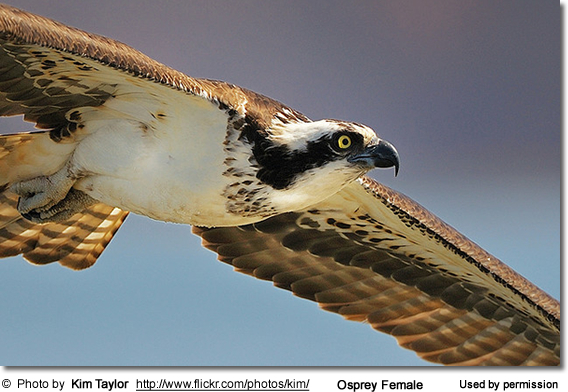 Ospreys are able to soar on wind currents, however, most of their flight is "active" - with wings flapping. It flies with a distinct bend in its wing at the "elbow," giving it a "gull-like" appearance. The juveniles resemble the adult, but it has streaked feathers on the head. There is barring on the underwings and flight feathers. The dark back feathers are white-tipped. They have fewer markings on chest. Their eyes are orange. Ospreys are of breeding age when they are about 3 - 5 years old. However, in the absence of suitable nesting sites, they may delay breeding until they are 5 - 7 years old. The breeding season varies according to latitude. USA: In Florida, they nest from January - April; although eggs have been found as early as December. Further north in the United States, they start later - with most nesting activities occurring from March - August. Australia: In Southern Australia, they breed from September - October; in northern Australia from April - July. The male osprey courts the female with aerial acrobatics and by presenting her with food or nesting material, accompanied by a courtship call. The male feeds the female throughout the nesting season, even before nesting, Ospreys are generally monogamous and mate for life; however, in some rare instances, polyandry has been observed (one female with several mates). The males select the nesting site, which is usually nest within 2 - 3 miles (3 - 5 km) of a shallow water body, such as salt marshes, swamps (mangrove, cypress), streams, shorelines, islands, freshwater lakes, rivers or reservoirs. They usually nest on tall dead or open-topped trees with flat tops. They have also constructed their nests on cliffs, rocks or, occasionally, on flat ground. Some ospreys nest in colonies. Ospreys may also take advantage of man-made structures, such as utility poles, pylons and towers. Many also accept specially designed osprey nest platforms that are provided for them to encourage Osprey breeding activities. This conservation measure was instrumental in helping the osprey recover from the drastic population reductions seen in the 1950s and '60s caused by common use of pesticides at that time. 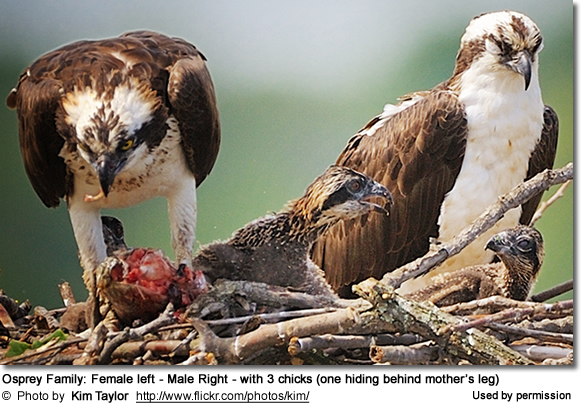 Osprey pairs build and reuse the same nest year after year for raising chicks as well as a home base for adults. 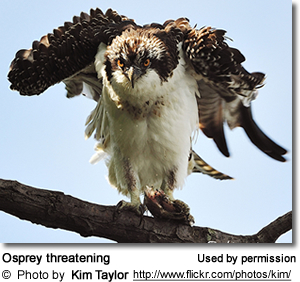 The large Osprey nest is typically situated 10 - 60 feet or 3 - 18 m off the ground. It is a bulky mass of coarse sticks, driftwood and other debris lined with seaweed, bark, sod, vines, grass and other available soft materials - even plastic bags, hula hoops, rag dolls or toy boats. There is a shallow indentation in the middle into which the eggs are eventually laid. If the pair has no nest, they both collect the sticks and grasses to build one. As they return each year, they will add to the existing nest, undertaking any necessary repairs and making the nest bigger and stronger. 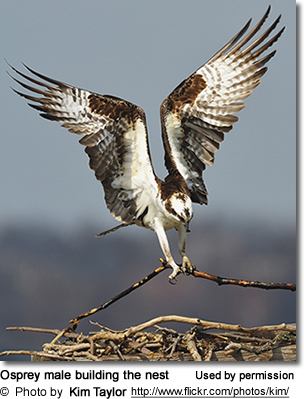 An old osprey nest can weigh up to 1,000 lbs. The average clutch consists of 3 eggs, but 1 to 4 eggs are possible. The eggs are creamy white to cinnamon with dark brown or reddish-brown spots. The eggs are slightly larger than chicken eggs, measuring about 6.2 x 4.5 cm (2.4 x 1.8 in) in diameter and weighing about 65 g (2.4 oz). Both the male and the female brood the eggs for about 5 - 6 weeks; however, the female does most of it and she relies on the male to feed her during this time. The chicks - also commonly referred to as eyas - usually hatch sequentially, 1 - 5 days apart. The hatchlings weigh only 50 - 60 g or 2 oz. They are covered with down and their eyes are open. Initially, they are only capable of limited motion. Both parents feed the young; but the male does most of it, as the female remains in the nest to look after the chicks and to protect them from predators. The returning male will often give the most nutritious parts of fish to his mate and the chicks; while he contends himself with the head and tail of a fish. At those times when food isn't abundant, only the oldest or two older chicks survive. The youngest and smallest chicks usually can't compete with their larger siblings and many of them die of starvation. The young ospreys fledge (leave the nest) when they are about 8 to 10 weeks old (sometimes as early as 6 weeks). Ten to fifteen days before fledging, the young ospreys practice flapping their wings, which causes them to become stronger. They are also observed jumping up and down on the nest until a wind gust carries them over the edge. Their parents may encourage them to take the first leap by tossing a fish near their young. 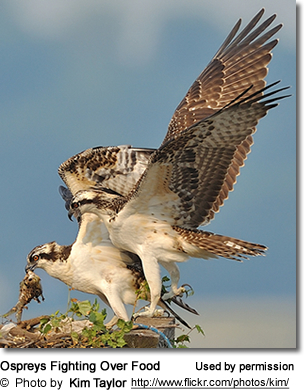 The young may continue to be fed by their parents for another two months after fledging. Ospreys typically hunt alone in the early morning or late afternoon. This could be due to the fact that the light is best for sighting underwater prey; although this feeding pattern is shared with most other bird species. Ospreys rarely hunt over the open sea. They generally prefer calm shallow waters with trees or structures for perching. They are often observed feeding in estuaries, mangroves, freshwater wetlands and man-made habitats, to include reservoirs, rice fields and irrigation canals. They avoid mountainous regions. Their diet consists almost exclusively (99+%) of fish, including flounder, bullhead, and perch. They favor fish that weigh 150–300 g (5 - 10 oz) and are about 25 - 35 cm (10 - 14 in) long; however, they will accept fish that weigh from 50 to 2000 g (2 - 68 oz). They usually catch about 1 - 3 fish a day; when raising 2 - 3 chicks, they have to catch 6 - 8 fish a day to provide adequate nutrition for them. Occasionally, they eat frog, snake, small reptiles, other birds, and mammals, such as rodents, rabbits and hares. Ospreys are not scavengers and usually only eat live fish; although they might accept the occasional dead fish they come across. 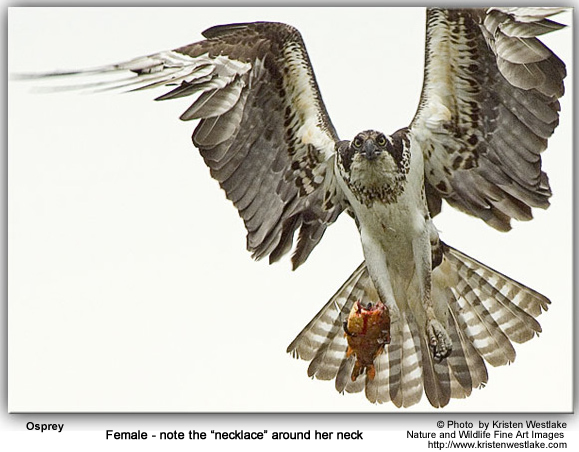 When hunting, the Osprey flies about 10–40 meters (32–130 ft) above the water, searching for fish near the water's surface. 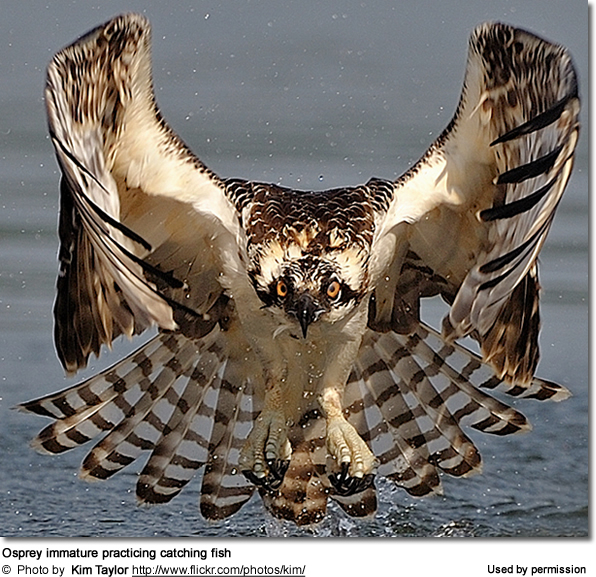 When a fish is sighted, the Osprey first hovers of the water and then plunges from the air into the water feet first using a reversible front talon and foot pads with small impaling spines that allow it to easily grasp slippery fish. In preparation for its way back to its feeding perch, the Osprey uses its reversible outer toe to grip and reorient the fish in its claws so that its head is pointed forward - this makes the fish more aerodynamic and easier to carry. 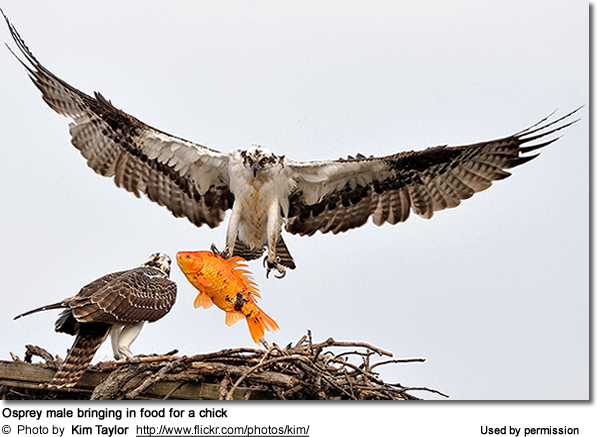 It sometimes happens that an Osprey captures a fish that is too big to carry. 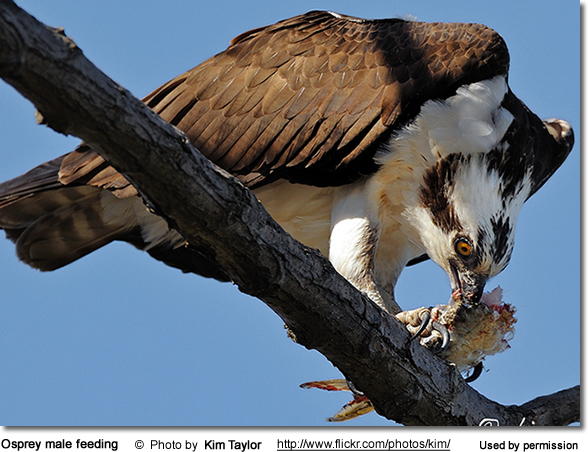 If their talons (claws) get stuck and the osprey can't release the fish, it will dry to drag the fish to shore. If that fails, Ospreys have been known to be pulled under the water by the weight of a fish and drown. the feet have two toes pointing backwards (most birds only have one toe facing backwards - also facilitates grabbing and holding onto fish. their strong hooked beak allows them to easily tear fish into bite-sized pieces. Their calls are described as a series of sharp cheep, cheep or yewk, yewk. If alarmed or disturbed - particularly near their nests, their call is a frenzied cheereek. The female's voice consists of plaintive whistles. 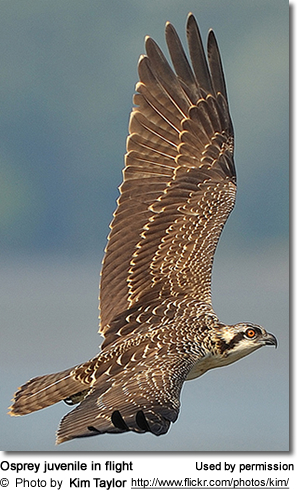 The Osprey's global population is estimated at 460,000 individuals. 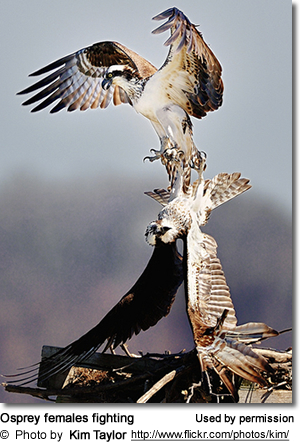 Due to conservation efforts, the Ospreys have made significant recoveries. Even though they are not currently considered endangered or threatened under U.S. Endangered Species Act, they are protected under Migratory Bird Treaty Act of 1918, which makes it illegal for people to "take" migratory birds, their eggs, feathers or nests. The cutting down of dead trees reduces suitable nesting habitat. The use of chemical fertilizers, pesticides and other pollutants run off into the water and reduce fish populations. Its numbers drastically declined in 1950 to 1970s due to the use of the pesticide DTT, which run off into the lakes and rivers, and were absorbed by fish - the primary diet of Ospreys. This poison interfered with the bird's calcium metabolism resulting in thin-shelled, easily broken or infertile eggs. Therefore, Ospreys faced extinction as they couldn't produce enough young to maintain its population. Even though this species has somewhat recovered in the United States, it is still listed as endangered or threatened in some states, especially in inland states. There is evidence for regional decline in South Australia. They have disappeared from their former territories in the Spencer Gulf and along the lower Murray River. 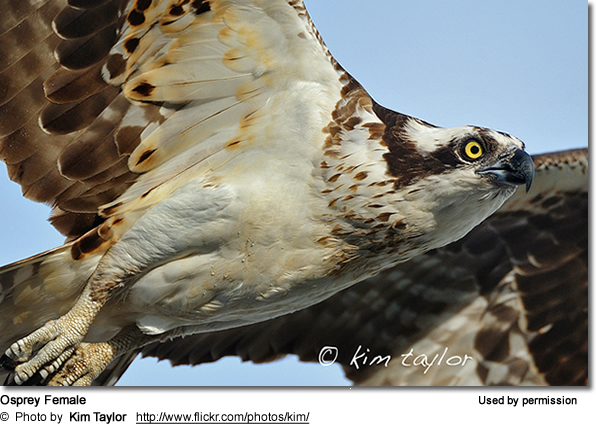 Ospreys are protected under Migratory Bird Treaty Act of 1918. In many countries, the use of DTT was banned in the early 1970. ... in an open / exposed location (not under or within the canopy of a tree). ... at least 600 feet away from human activity and away from busy recreation areas. In most cases, an Osprey nest consists of a long pole with either a circular or rectangular platform securely mounted on top of it. Rectangular platforms should have side dimensions of at least 2 feet on any side, with a minimal 3-foot diagonal. Circular platforms should have a diameter of at least 3 feet. The pole should be as tall or taller than other surrounding structures - the platform nest should be situated at a minimum 15 feet above the ground. The structure should be strong enough to support a nest weighing 200 pounds or more. An average-sized nest measured in Oregon weighed 264 pounds (120 kilograms) and was 41 inches (104 centimeters) in diameter. Provide an elevated perch to attract the ospreys to the nest. This perch should be about 3-feet above the nest. A predator guard should be installed at the base of the nest structure to prevent the eggs or chicks from being easily reached by predators. The nest should be inspected annually. If the nesting material is more than 1.5 feet deep, remove a layer of sticks. Be Patient! The platforms may take as long as five years to be occupied by a pair of nesting osprey. 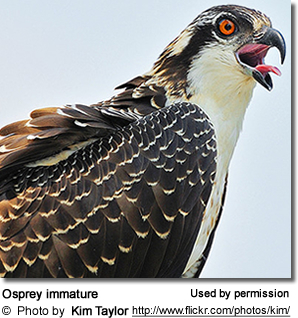 Please provide to this website for instructions and a diagram for building an osprey nest.